Writers’ Buildings, Kolkata – 1. The undersigned is directed to say that in terms of Finance Department Memo No. 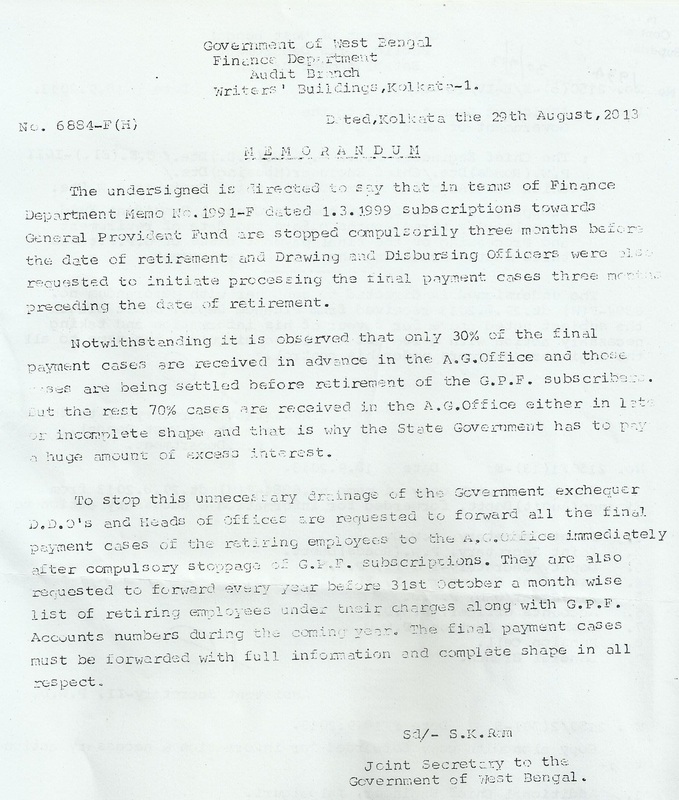 1991-F dated 1.3.1999 subscriptions towards General Provident Fund are stopped compulsorily three months before the date of retirement and Drawing and Disbursing Officers were also requested to initiate processing the final payment cases three months preceding the date of retirement. Notwithstanding it is observed that only 30% of the final payment cases are received in advance in the A.G. Office and those cases are being settled before retirement of the G.P.F. subscribers. But the rest 70% cases are received in the A.G. Office either in late or incomplete shape and that is why the State Government has to pay a huge amount of excess interest. To stop this unnecessary drainage of the Government exchequer D.D.O’s and Heads of offices are requested to forward all the final payment cases of the retiring employees to the A.G. Office immediately after compulsory stoppage of G.P.F. subscriptions. They are also requested to forward every year before 31st October a month wise list of retiring employees under their charges along with G.P.F. Accounts numbers during the coming year. The final payment cases must be forwarded with full information and complete shape in all respect. Forwarding Pension Cases to the Accountant General (A&E), W.B.